Birds of a different feather . 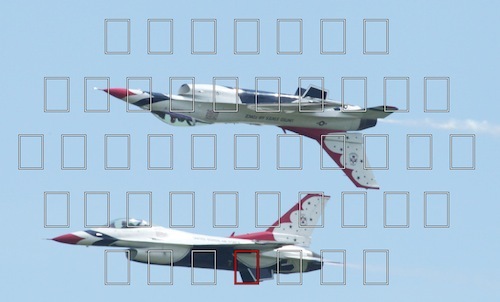 . . Air shows are a great excursion for the family - and a super way to extend your photography into new areas. Here are tips and tricks to get you started. It's easy to get caught up in the excitement and not realize you're getting over heated so take care. Good walking shoes - you will be doing some "walking"
Check the air show website for FAQ's, it's not uncommon for a show to prohibit bags - you may have have to hump your equipment in without your camera bag. Focusing Mode: AI Servo (as Canon calls it) is mandatory. These guys fly pretty fast! Aperture: it can be hard when you need light, but you don't want to shoot too close to your maximum aperture. With even a single aircraft, you could need 12-20 feet of depth of field to get the entire ship in focus. Single aircraft: f/8 is minimum, assuming a good distance between you and the aircraft in flight. 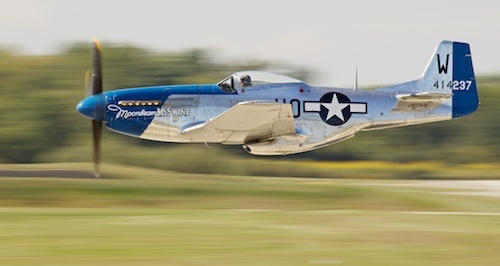 Evening shows: many air shows will have a Friday night event at dusk - take advantage of these! Look for different angles, including aircraft flying away from you - unlike animals or people, there is no "head angle" to worry about! Check back soon for these informative posts. A low perspective almost always adds interest. Whenever possible, shoot at eye level (or the equivalent in your subjects) to gain interest, perspective and drama. It's comfortable to make pictures from your standing position but that rarely gives you the best angle. Squat, get on your knees, sit or lay down. Like my friend Rick Sammon says "use you camera like a spaceship!" Panning Shots - The Practice is Worth it! 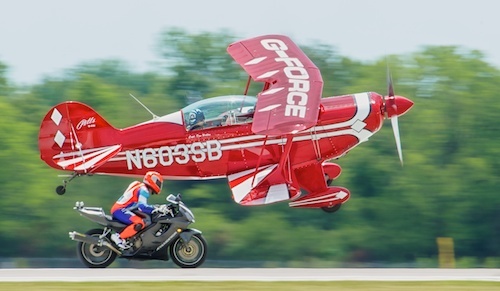 The bike shot below (shutter speed of 1/ 180th) was extra difficult as the bike and plane were not traveling at the same rate of speed for most of the run. 20 images yielded only one that was sharp enough. There really is no substitute for it, and it's amazing how much better your equipment seems to work when you practice! Don't get discouraged. Action shooting has a lot going on, focus on one issue at a time (panning, lower shutter speed captures, exposure, composition) and build up gradually. 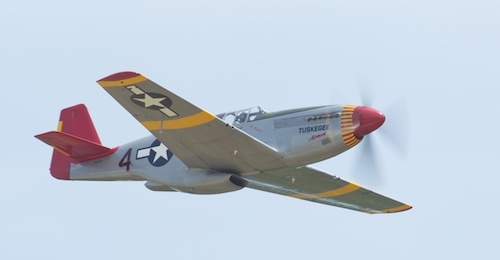 Want to learn some other Air-show basics, check out this article from the beginning of the 2013 season. Have fun and stay in focus! Thunderbirds are Back in the Sky! Our team is back in the sky! Don't expect them to revisit any of their 2013 air show cancellations, but they have been funded for flying time through October. He Went . . . That Way! It's all fun and games to the spectators at the air shows, but it's a deadly serious business to the performers. These men and women are true athletes in every sense of the word - think of the strength, endurance - and guts - it takes to perform these stunts. These performers are also carrying on a tradition that extends back to just after the first world war, although there were some early pioneers such as Didier Masson, Lincoln Beachey and Glenn Curtiss. "Barnstormers" delighted the crowds, gave rides and introduced the upcoming generation to the thrill of flying and the importance of air power. Looking for some good clean family fun for next Saturday's movie night? Be sure to check out Those Magnificent Men in Their Flying Machines! A great movie from 1965. And the next time you see these guys on the ground after an air show, take the time and pay them their due.